A new year means new resolutions. Maybe your resolution is looking to spend more quality time with family and friends? Learn something new? Spend more time outdoors or being active? This is the year to follow through on that resolution and discover boating – an activity that can accomplish all of the above. Boating counts more than 88 million Americans getting on board each year and not only creates priceless memories with loved ones, it helps kids and adults disconnect from technology and reconnect on the water. In fact, more than half of Americans say getting out on a boat is one of the best ways to bond with family, according to a 2012 survey by Discover Boating and Kelton Research. If boating is on your radar, getting started can be easy. Ring in 2014 by shopping a local boat show to learn more about what, when, where and how to fish, sail, wakeboard, ride personal watercraft, cruise and more. Throughout the winter and spring, hundreds of boat shows are held around the country and they provide a taste of the boating lifestyle, deals on boats for every budget, and an opportunity to compare boat brands side-by-side. 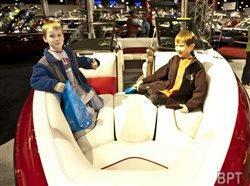 Boat shows are a buying environment with hundreds of new-year models at special show pricing. It’s simple to find a show nearby with the Boat Show Finder, which locates shows within a 200-mile radius. Once you locate the nearest boat show, use these insider tips to get the most out of your experience. * Find your virtual dreamboat. Before visiting a boat show, you’ll want to know which boats to shop. Start your search online with DiscoverBoating.com’s Boat Selector to identify which boat types fit your lifestyle, interests and budget. Plug in your preferences for on-water activities, number of passengers, boat length, price range, and propulsion to narrow down boat options before leaving home. * Make the most of show pricing. It helps to know what fits in your budget before shopping a show. Use this boat loan calculator to estimate monthly payments, which can be as low as $ 250 a month or less. Since one of the best times to buy a boat is at a boat show, exhibitors generally offer special show pricing and other incentives during the winter season. * Learn the ropes. Boat shows provide opportunities for beginners to learn about getting on the water, and experienced captains to hone their skills. Look for shows offering interactive workshops and seminars, including knot-tying, DIY boat maintenance, and docking. It’s not only fun to learn new skills, but smart to take advantage of the onsite training boat shows offer usually at little to no cost. * Bring the whole family. More than a shopper’s paradise, there’s fun to be had by everyone. Boat shows often offer free activities to keep the kids entertained, including fishing, paddlesports, sailing simulators and more. Plus, it helps to make boat buying a family decision, keeping in mind which activities will appeal most to the kids and the adults. * Look for the seal of approval. When shopping for a boat at a show, online or at a dealership, always check to make sure it is certified by the National Marine Manufacturers Association. An “NMMA Certified” seal means a boat has met strict industry standards for safety and construction and federal regulations, ensuring the best quality to the buyer. Look for the NMMA certified sticker near the helm and find a full list of certified boat manufacturers at DiscoverBoating.com. This year, keep that new year resolution to get on the water and have some fun. Whether in the market for a boat or just curious about the boating lifestyle, the first step toward keeping that resolution is to visit a local boat show this winter.